Obviously, smaller lot sizes translate into less space for items like rainwater tanks. This might pose a problem if you wish to install a large round tank above ground. Yet, thankfully, the more humble slimline tank require less space, being easily situated at the side of your house or a fence line. Why Choose a Slimline Tank? Slimlines offer all the benefits of any other rainwater tank such as water cost savings by reducing mains water usage, providing alternative water for keeping gardens green and reducing stormwater run-off helping to reduce local flooding. Space-saving – the compact nature of a slimline is probably the greatest benefit. If space is limited on your property, then a slimline can easily fit along the outside wall, in narrow section between your home and fence-line or even under external stairs. Appearance – While beauty is said to be in the eye of the beholder, slimline tanks have unique looks that some homeowners may use a design feature or a space divider. Slimlines give a more contemporary feel and can more easily blend in with surroundings. There are sometimes codes and standards that must be met for water sustaintability when building a new home. Sometimes they are mandatory, other times optional. In many cases, local governments set the requirements for their region. 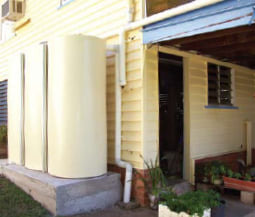 For example, some councils in Queensland might adopt certain rainwater tank requirements found in the Queensland Development Code (QDC). 5,000 litres minimum for single detached houses. 3,000 litres minimum for non-detached houses (such as terrace houses, townhouses and semi-detached houses). Clark Tanks’ slimline tanks are found in 2,000L, 3,000L and 5,000L sizes, meaning they will comply with most government recommended standards. Should additional capacity be desired, two or more can be purchased and linked together for greater water storage. Looking to buy a slimline tank? Slimline tanks can be found in an abundance of colours and their popularity means they have become relatively inexpensive to purchase. If you are interested in a slimline tank or two, check out our range of slimlines or call our friendly team to discuss your options. While slimline tanks are often a great option, our staff are always happy to provide you with the right advice and assist with an appropriate rainwater solution appropriate to your needs.